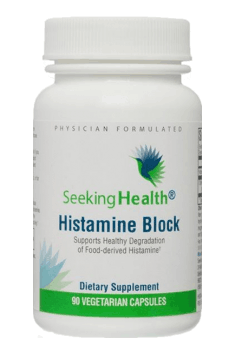 Seeking Health Histamine Block is a supplement containing the enzyme diamine oxidase (DAO), which is responsible for the breakdown of histamine present in food. The supplement also contains a small amount of vitamin C, which has a beneficial effect on DAO’s half-life and prolongs its activity. The preparation is recommended for people with histamine intolerance or hypersensitivity. Taken before the consumption of histamine- and amine-rich foods, it supports their breakdown and reduces the symptoms of allergy. The active substance contained in the supplement is active directly in the small intestine. It does not permeate into the bloodstream and does not cause any systemic effects, so it can be used without the risk of side effects. Diamine oxidase (DAO) is an enzyme responsible for extracellular histamine breakdown. It determines its metabolism by the means of oxidative deamination. It is produced by enterocytes, that is intestinal mucosa cells, and by the placenta of pregnant women. Its greatest amounts can be found in the gastrointestinal tract, some amounts also in the kidneys and the liver. The activity of the enzyme DAO is very easily inhibited. Popular drugs are its powerful blockers (antibiotics, contraceptive pills, steroids, diuretics, analgesics), as well as alcohol and amine present in highly-processed food products. DAO deficiency can result in disorders in the functioning of the gut. It is also worth knowing that DAO’s normal activity requires proper amounts of copper and vitamin B6. Diamine oxidase deficiency results in malfunctioning histamine metabolism. In turn, the excess of histamine in the organism gives various negative effects. They usually look like typical food allergies and the problems with the digestive system that accompany them, but other symptoms that might appear are swelling, rash, sinus problems, or heartbeat rhythm problems. The substance broken down by the enzyme DAO, histamine, is one of the compounds called tissue hormones. It is naturally produced in the organism out of histidine, and its main storage locations are mast cells and basophils. Large amounts of histamine also enter the organism from external sources. Its great concentrations are present in fermentation products, dairy products (especially regular cheese and blue cheese), alcohol, seafood, and highly-processed food products stuffed with flavour enhancers like sodium glutamate. Additionally, there are products that contain no histamine but increase its systemic activity (like chocolate, citrus, bananas, strawberries). They might prove to be a problem for some people as well. It is important to be aware that histamine is essential for the normal functioning of the organism. It performs the function of a pro-inflammatory mediator, participates in blood transport, and affects digestive processes. Only the lack or distortion of specific mechanisms responsible for its breakdown makes it hard to maintain its proper levels, which in turn results in disorders in the functioning of the organism and leads to the symptoms of histamine intolerance or hypersensitivity. The supplement was designed in order to increase the amount of DAO in the gastrointestinal tract and enhance the breakdown of histamine of food origin. It should be highlighted that it is active directly in the intestines, so it does not affect the natural production of the enzyme in the organism. The reason it is completely safe is that it is transported directly to the bloodstream and does not exhibit any systemic properties. The preparation should be taken right before a meal containing potential histamine sources. The half-life of the active substance is rather short but sufficient to break down histamine as well as properly stable thanks to the content of vitamin C.
The supplementation with this preparation helps to reduce total histamine levels in the organism, as it removes it from potential exogenous sources. It is often enough to reduce the concentration of histamine below the so-called tolerance limits and eliminate the symptoms of allergy. It is worth noting that histamine is an inflammatory mediator. Controlling its amount with the use of the enzyme DMAO helps to regulate the inflammatory response in the digestive system. It is of great significance when it comes to maintaining the right condition of the intestines, the stomach, and other parts of the digestive system. To sum up, Seeking Health Histamine Block is an excellent method of reducing histamine levels. It will prove perfect for people with reduced activity of deficiency of the enzyme DAO. It easily neutralises histamine present in food and drinks, which often helps to reduce digestive discomfort and reduces the risk of allergic reactions. The supplement has a fantastic effect on people with histamine intolerance or hypersensitivity. It can be used in the case of clinically confirmed DAO deficiency or its reduced activity. The preparation supplements DAO levels and helps to break down histamine consumed with food easily. The efficacy of the supplement requires strict compliance with the rules of its use. The systemic activity of DAO is short, so the preparation should be taken no more than 15 minutes before the anticipated consumption of a histamine-rich meal. 1 or 2 capsules are estimated to be a sufficient dose. Microcrystalline cellulose, HPMC (capsule), sucrose, rice starch, shellac, hydroxypropylcellulose, polyvinylpolpyrrolidone, hydrated magnesium silicate, acetylated corn starch, sodium carboxymethylcellulose, and glycerol.